Is it a bad idea to make predictions in your investment commentary because clients will slam you when you’re wrong? Whenever you make predictions, you run the risk of being wrong. But being wrong isn’t a problem, in my mind, if your prediction reflects good thinking. Accurate predictions alone don’t make you seem smart. I remember the time I was forced to participate in a betting pool with members of an investment policy committee. I had to guess where a certain number—probably the 10-year Treasury rate—would be one quarter later. Guess what! I won. However, it wasn’t knowledge of Federal Reserve policy or the economy that inspired my winning bet. It was that I deliberately picked a rate 25 basis points (0.25%) lower than any other committee member’s bet. Did I respect the losers less after I won my bet? No. They had well thought-out ideas about the factors driving bond yields. As a result, I continued to think highly of them. The lesson is that smart people can and will be wrong. After all, look at any major investment firm’s quarterly predictions of statistics such as the fed funds rate, gross domestic product (GDP) growth, or the consumer price index. Most of the time they are wrong. Heck, the federal government revises its GDP numbers as new data comes in. Investment commentary that only reports facts is often boring. Plus, unless you’re pumping out commentary instantaneously, you’re not telling your readers anything they couldn’t already learn online or in The Wall Street Journal. They have no reason to read your factual, unopinionated commentary. Keeping your clients interested isn’t the only reason to make predictions—or, at a minimum, express opinions. When you support your predictions with carefully reasoned arguments, you give clients insights into your firm’s thought processes. That’s valuable. Imagine, for example, that you predict that the Federal Open Market Committee will boost its fed funds target later in the year. By itself, that’s not so interesting. What makes it valuable is why you think that’s true and what you recommend based on that prediction. Unexpected events—war, natural disasters and the like—can sabotage your predictions. 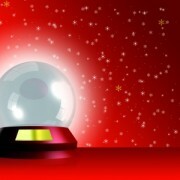 However, they may only delay your predictions coming true. Clients will find comfort in the soundness of your thinking. What if you’re repeatedly wrong? Repeatedly making big predictions that don’t pan out can bring client criticism and even defections. But sometimes the strength of your convictions means you must stick with them to remain true to your investment philosophy and process, as well as for the good of your clients. For example, some asset management firms shunned dot-com stocks during their heyday, predicting a price collapse that ultimately occurred. The clients who stuck with them benefited over the long run. 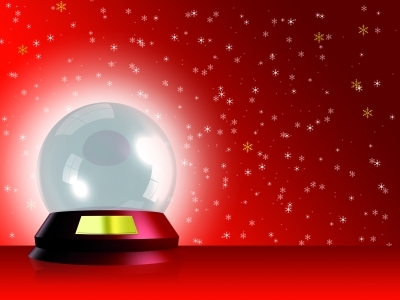 Don’t make flashy predictions simply to attract attention. One day, or even one month, of fame on social media or in the news isn’t worthwhile. Do make predictions that are grounded in careful analysis. You need to be able to explain predictions. Explain your predictions. Help your readers to understand why you made your predictions and why the predictions are important for client portfolios. 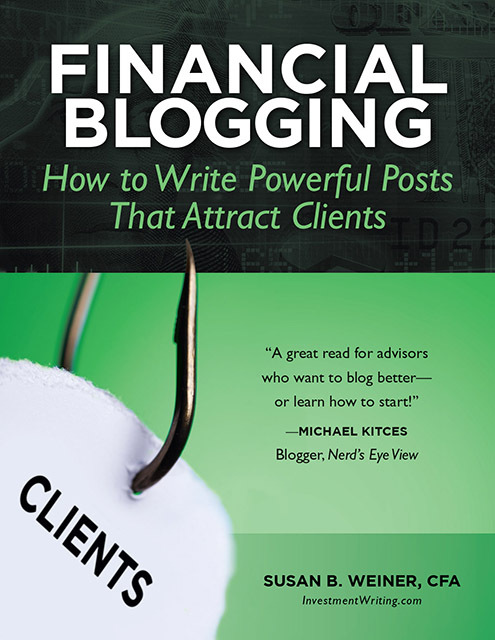 Whenever possible, relate what you write to its impact on client portfolios. For example, if you foresee a rebound in the Russian ruble, explain how this might affect sectors your portfolios hold or avoid. Hedge when necessary. To keep the Securities and Exchange Commission happy, you can’t guarantee anything. Use language such as “we believe” to make it clear you’re expressing an opinion. 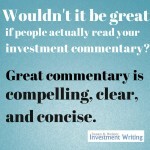 Hedging language also helps readers grasp that you understand there are factors that can derail the most likely scenario. You’re not pigheaded. You consider the relevant factors. Use personality if you lack opinions. If you lack provocative opinions, but you want people to read your commentary, use your personality. Writing in a distinctive style and tailoring your content to your clients’ unique needs can help you get attention from your target audience. I’m interested in learning from you. How do you balance the benefits of expressing your opinions vs. the risks of being wrong? Please comment. https://www.investmentwriting.com/newsite/wp-content/uploads/2015/09a/ID-10056854.jpg 300 400 Susan Weiner, CFA https://www.investmentwriting.com/newsite/wp-content/uploads/2016/12/investmentwriting_logo_2016.png Susan Weiner, CFA2015-07-14 05:29:092016-08-26 12:41:57Are financial predictions too risky for investment commentary writers? Great suggestions, Susan. Especially #s 2 and 3, which I try to integrate whenever I write commentaries. I believe predictions (or as I like to call them “outlooks”) are valuable for investors because they help set expectations for the future. They may end up being off-base but if written well a manager should worry less about going out on a limb with a forecast. I would also add tying predictions back to an investment philosophy or process as a #4 suggestion. Not only does this help shield manager from some of the shame of making a wrong prediction, but it can also reinforce the value of the work a manager does on behalf of clients or investors. I like your suggestion for #4. Thank you for commenting! I believe that predictions destroy the credibility of technical analysis. When a prediction is made using the market’s technicals, it shifts the emphasis away from the market and places it solely on the individual. When it’s wrong (prediction) as is often the case, many professionals will blame technical analysis and claim it doesn’t work. That’s interesting. I thought of technical analysis as a means of making predictions that guide investments. I’d enjoy further discussions with you regarding technical analysis. If you’re interested, please contact me at your convenience.